I mean, how small can you go with a nuclear bomb?! I didn’t go to see the RSC’s Oppenheimer in Stratford because I wasn’t massively drawn in by the premise; the story of the man who created the atomic bomb (the eponymous J. Robert Oppenheimer). Then, however, the five star reviews started rolling in, and these, combined with a West End transfer to the Vaudeville Theatre, convinced me that this was something worth seeing. 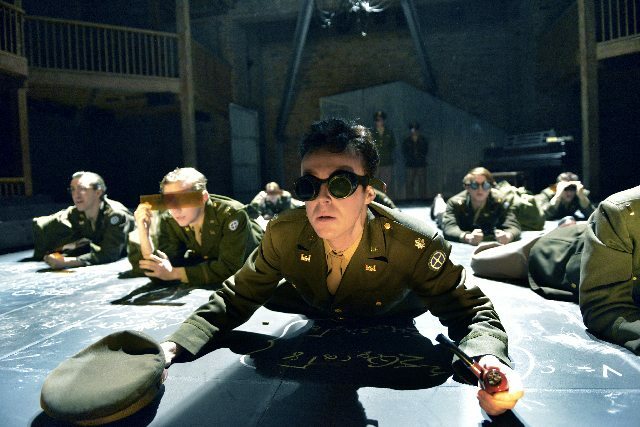 The main draw here for me was definitely the cast, particularly lead John Heffernan as Oppenheimer himself, conflicted and drawn between his originally radical ideals, his desire for scientific renown and respect, and his growing involvement with military and political America. Heffernan is proficient at showing the transition in Oppenheimer’s personality over the years, whilst still maintaining the same ‘iron core’ that is mentioned about him several times during the play. 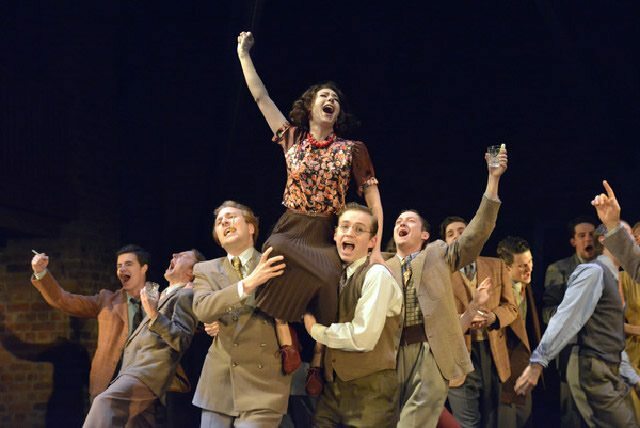 The rest of the cast are also strong, with my personal favourites being Sandy Foster and Jamie Wilkes as Charlotte and Bob Serber, Oppenheimer’s loyal friends and colleagues and Catherine Steadman as Jean Tatler, a radical communist, and Oppenheimer’s first lover. However, this brings me to the first real problem I had with Tom Morton-Smith’s script. None of the characters’ backstories were fully fleshed out, even though the little glimpses we caught of them were incredibly intriguing. Jean, for example, started off as my favourite character, and yet she virtually disappeared from the story, only reappearing briefly midway through to bring her story to a tragic end. Yes, I understand that she has no large part to play in the story of the nuclear bomb itself; but then perhaps it’s better to edit her out? This is really the main issue with the play itself; it can’t quite work out if it’s telling the story of the nuclear bomb or of Oppenheimer. If it’s about Oppenheimer, then why are the relationships between him and his younger brother, and between him and his wife, fleshed out so little? Especially since the production is three hours long (including interval.) It definitely feels like Morton-Smith became interested by so many little details that the play never felt quite whole – like the split atoms in the play, it was split off into a thousand differently sized pieces, that didn’t make up a perfect unit within themselves. Saying this, I wasn’t actually bored at any point. The cast are of a strong enough calibre, and director Angus Jackson has created enough continual action and interest points, to easily keep their audience’s attention. Although the nuclear bomb itself looks a little ridiculous, the explosion is well done, and I loved that it turned into a disco ball afterwards; it kind of showed the crazy transition these scientists would have to make in Los Alamos, where the bubble they were in, heavily restricted by the US military, perhaps prevented them from really knowing taking in the impact of what they had just created. 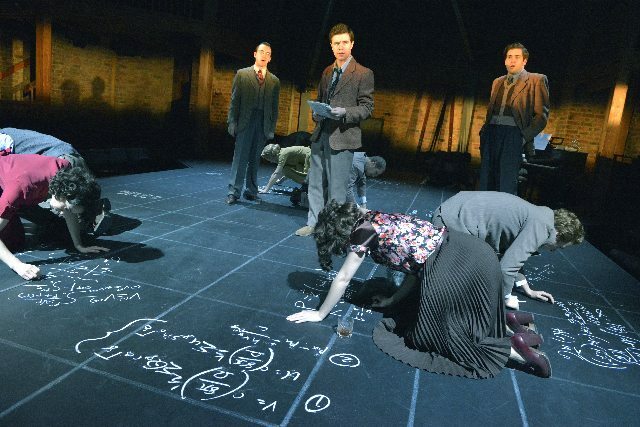 Another great set idea by designer Robert Innes Hopkins is that the entire floor and sections of the walls are blackboards, which the cast are continually scribbling very impressive-looking equations, definitely giving the atmosphere of a hotbed of brains constantly whirring. The science behind the nuclear bomb is actually explained very clearly, directly to the audience, as though the characters are giving a lecture. I’m not sure if this was absolutely necessary, but it was definitely interesting, and if you’re wanting to get your kids more involved with science, then this is the one to take them to! Then again, perhaps not. The terrible results of the Nagasaki and Hiroshima bombs on civilian life are dealt with powerfully, if not for very long. Oppenheimer’s final speech is absolutely the highlight of Heffernan’s performance, where the full force of his emotion seems finally, truly, to be revealed. In all, a strong cast lead a weaker script in Oppenheimer. The story behind the creation of the nuclear bomb, the ethics, the growing fear of communism in the USA, life in Los Alamos, human life in the 30s and 40s; these are all interesting topics. Oppenheimer involves them all, which is both what makes its three hours enjoyable and thought-provoking, but also what creates its biggest problem: a lack of focus. 1 April 2015 - I mean, how small can you go with a nuclear bomb? !